As one of the most popular SUVs of the 1990's, the Explorer should have a lot of off-road accessories available for it. Well, the opposite is true. The great growth in SUV sales came with the advent of "friendly" SUVs such as the Explorer, SUVs that spent more time shuttling kids to soccer games and picking up groceries than hauling construction materials or actually going off road. The 2nd Generation Explorer moved the Ford SUV deeper into that "soccer-mom" territory by adding an independent front suspension (IFS). While assisting handling and ride comfort, it also reduced flexibility and strength on the front end. The Ford still retained a full body-on-frame design and a strong 31-spline 8.8" rear axle, but it was low and long and prone to hanging up on modest obstacles. The optional limited slip differential was great for street use (towing, etc. ), but left a lot to be desired in the dirt. When you look at how small the percentage of the Explorer-buying market was asking for lift kits, it's no surprise that it took years for the manufacturers to finally come out with them. It's a time consuming and expensive process to bring a product to market, businesses need to justify that time and money with revenue. 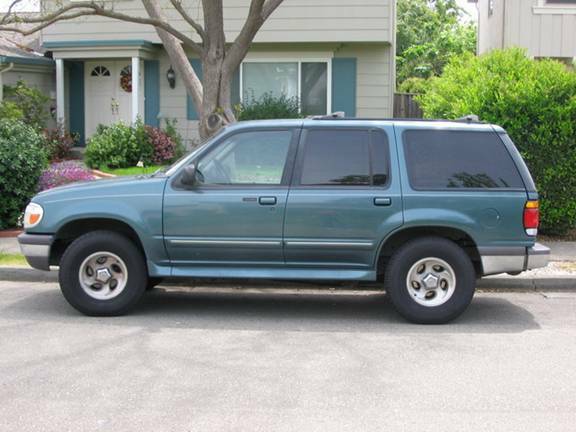 In 1997, with one kid in diapers and one more on the way, we traded in the wife's car for a brand new 1997 Ford Explorer XLT. Equipped with a 4.0 SOHC, and Ford's Control-Trac 4WD system, this was a good truck for us, as it could serve double-duty grabbing groceries as well as running to Home Depot as all young(ish) home owners do. Sure, I thought, we'd go to the snow more often, maybe go camping. Fast forward to 2001, and my wife's got about 70K miles on the Explorer and is tired of it. We buy her a new car, trade mine in, and I inherit the Explorer. All of a sudden, fixing it up for more competent off-road capabilities was a LOT higher on my priority list. My first upgrade (I wouldn't call it a modification) was going to Goodyear MT/R's, in 31x10.5 on the stock 15" alloys. These great tires really helped, and I was able to negotiate the mild stuff at Hollister such as the Frame Twister, although I scraped my frame in doing so. Time to get some clearance. I've decided to go with the Superlift 4" suspension lift primarily because it was one of only 2 kits available for the 2nd Gen, and it seemed that Superlift had done their homework. Lifting an IFS Explorer is pretty straight forward: A simple 4" drop assembly on the front lowers the differential and the suspension mount points. Moving the differential down is mandatory on the Explorer, without it you will chew up your CV joints as the angles become more extreme. For installation I brought it down to my local off-road shop, Boss Trucks of San Ramon, CA. After conferring with the owner, John Bosso, and his lift/fabrication technician, Tony, we scheduled the job. Boss Trucks, like any good shop, will go through the parts list and double check everything before getting started. You don't want to get half way through a lift and find out you have the wrong knuckles. Which is what we avoided: Superlift had sent along the knuckles from the very similar Ranger. A couple of minutes on the phone with Superlift's helpful and knowledgeable tech line resulted in a Return Authorization, and we swapped out the parts, no hassles. Superlift reports that they've instituted a new check system in order to eliminate packaging issues going forward. With the correct parts accounted for, Tony went to work. Most of the front end comes out, I should have had them put in a locker for me as well! The front lift kit is almost identical to the Superlift kit for the Ranger. These kits use a nodular iron knuckle, just as they do for their F-150 kit. This knuckle has repositioned ball joint and steering rod mount points in order to keep correct geometries, included CV Joint angles. The bracketry is 3/16" plate steel, and everything is powdercoated gloss black with the exception of the unfinished knuckles. This system reuses the factory torsion bars, and provides new sway-bar links of the correct length for the lift. The rear lift is accomplished via replacement springs. My kit came with the Superide� Springs and Superide� Shocks. Superide� Springs provide a softer-than-stock spring rate, while increasing total travel. Superide� Shocks are their entry-level shock system. They have "Superide� Select" by Bilstein as a possible upgrade for many applications, as well as multiple shock systems. Since my Explorer is still going to be used for hauling stuff back from Home Depot, I stuck with the stock shocks. I also have the optional double-cardan front driveshaft. With the lift, your driveshaft angle increases, and although your stock shaft may survive, the extra wear and tear on it is substantial. Given that my truck has 145,000 miles on it, the new drive shaft was an important and necessary upgrade. I topped this off with the optional front skid plate. The rear upgrade was as straight-forward as you might imagine. Old springs and shocks off, new ones on. No brake line extensions were necessary, as the Explorer brake lines flex/pivot from an area near the front spring mount, requiring no extra length (just a bit more flex). Superlift provides new sway bar links to keep everything lined up properly. The front upgrade was a little more challenging. Tony found that the original torsion adjuster cover plates, which are reused in this application, didn't fit properly over the new torsion bar drop brackets. In addition, the instructions called for a rectangular isolator to be reused between the torsion bar adjuster and the inside of the bracket. My 1997 Explorer doesn't have a separate isolator, it uses a Kevlar pad directly affixed to the torsion bar adjuster. 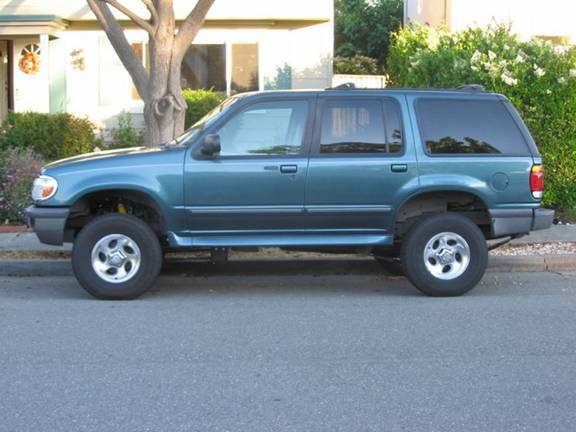 This kit is used for both the 1997-2000 Explorer as well as the 2000-and-up Explorer Sport Trac. Boss Trucks owner John did some investigating and found out that the insulator was unique to the Sport Trac. It looks like there are slight differenced between the models. Superlift is now aware of this issue, and will research it further. The action we took to work around this issue is what Superlift recommends in these cases. By purchasing a relatively inexpensive pair of insulators, and notching out the non-load-bearing cover plate, we were able to install the front system safely and securely. We'll follow up with Superlift, but my guess is that anyone else who has run into this has solved it the same way, as it's not unusual to run into minor fitment issues with trucks as there are many model variations as well as dimensional abnormalities caused by damaged from wrecks and hard-core wheeling. Here is a cleaned-up and notched cover, in place. The front lift uses a pair of crossmembers to do the actual lift. This can put some strain on the mounting points, as the 2 front crossmembers aren't connected fore-aft and must rely purely on the strength of the mounting points. Based on the dimensions of the plate and tube steel, this kit is plenty strong for the environments that an IFS lift is intended. If you want to really bash HARD against rocks, you should probably go to a solid front axle. A intelligent wheeler, especially one in a mild Explorer, should be taking the smart line and not using brute force to overcome an obstacle. Don't get me wrong, this kit is strong, but a custom upgrade to this might be to tie the front and back crossmembers together. Looking at the torsion bar drop kit, it's obvious that the brackets are an easy place to hang up on some rocks. Superlift's design is no different from their competitors, and it's just a limitation that IFS Explorers are going to have to live with. Tony has suggested that maybe we could add a second skid plate, one that ties from the cross members back to the torsion drop kit. This would protect you from hanging up on the torsion brackets, and if designed correctly, might bolster the front cross members by tying them in fore/aft with the torsion brackets. We'll discuss it some more and then I'll have him fab some up for me. While the skid plate looks like it ties the front and rear cross members together, it�s actually bolted the the cross members by a short extension, which would flex before the actual cross members started to move. This may be by design, as you�d rather have a skid plate bolts move than to transfer all the forces to the cross members. I haven't had the opportunity to take the new lift off any serious trails, but a few diagonal crossings of some local ditches impressed me with the new-found flex in the rear, and my ability to go places where I would have hung up previously. Ride on the freeway is great, the rear end is softer than stock but well balanced with the shock valving in the front. I do notice that the shocks are NOT gas shocks, but they are durable for an off-road beating, and you can always upgrade your shocks down the road. Due to the lack of nitrogen charge, the truck does have a bit less jounce control than with my old Tokico gas shocks, but off-road the ride is MUCH better. Those poor Tokicos were designed for driving the kids to day-care, not for getting down and dirty. I will update this report later after revisiting Hollister's "Frame Twister" where I bottomed out and slid over the rocks on my frame rails in previous visits. I should be able to crawl through that obstacle instead of using momentum to overpower it. That alone will save a lot of wear and tear on my old Explorer! I want to add that John and Tony at Boss Trucks did a great job dealing with some of the intricacies of this application, and I�d trust them to work on my truck any time. If you are in the San Francisco Bay Area, you should look them up and see what they can do for your truck, as they handle a full range of truck modifications including lift kits, towing systems, and now even sound systems.